On the internal network there are also applications and multi-functional devices that are relaying SMTP messages through the Exchange 2010 server. These messages are sent to recipients on the Exchange 2010 server, but also to external recipients through a dedicated Receive Connector on the Exchange 2010 server. The fun part starts here. The NetBIOS domain name is Inframan, but the FQDN of the Active Directory (single forest, single domain) is Inframan.local. As such, users login using Inframan\J.Brown, the Inframan organization never used the UPN and this is set the default value, which is J.Brown@Inframan.local. For message hygiene, an Exchange 2010 Edge Transport server is used using a Realtime Blocklist (RBL) from SpamHaus, Recipient Filtering is configured and some custom words are using in the Content Filtering module of the Edge Transport Server. And yes, this has been working for years. Inframan has approx. 500 Mailboxes and estimated that a migration to Office 365 will take over 6 months. In these 6 months, they need coexistence, and the user accounts are kept in the on-premises Active Directory an Exchange 2010 hybrid scenario will be implemented. Note. 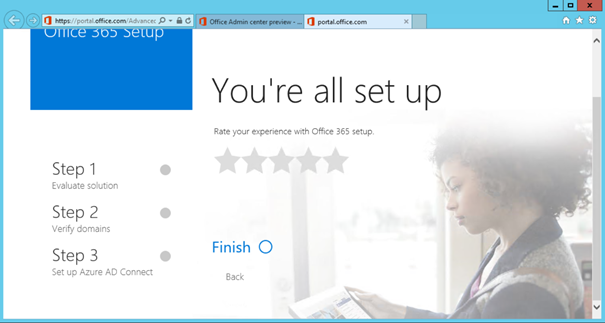 Usernames and passwords will be synchronized with Office 365 and this is sufficient for now. Single Sign-On via ADFS (Active Directory Federation Services) is not implemented in the Inframan environment at this moment. 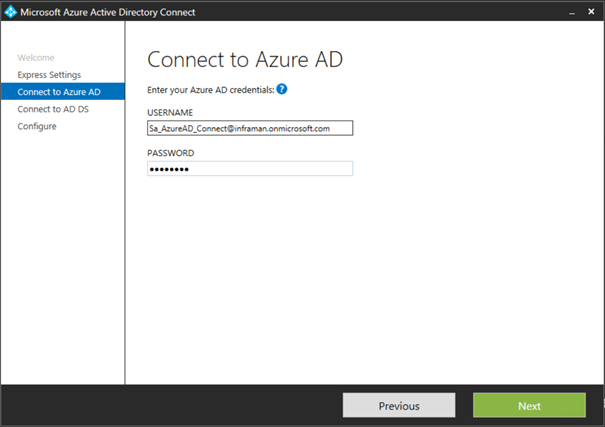 Azure AD Connect will be used to synchronize user accounts and passwords from the on-premises Active Directory to Azure Active Directory which is the underlying directory for Office 365 and Exchange Online. 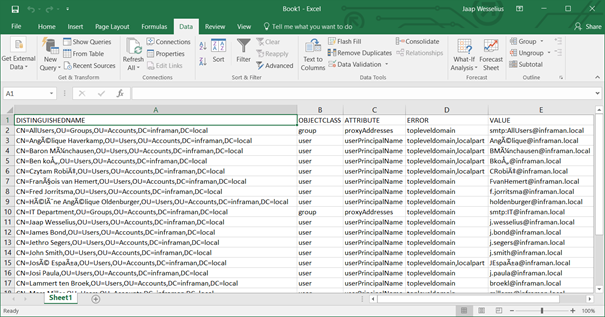 When you run the IdFix tool it shows a list of issues in your Active Directory on the console, but you can also export it to a CSV file for analysis in Microsoft Excel for example. Figure 3. The same issues exported to a CSV file and imported into Microsoft Excel. In this environment there are some strange (diacritic) characters that need to be fixed, but also the UPN is configured incorrectly and some email addresses with a .local TLD exists. A prerequisite for Azure AD synchronization is that the User Principal Name or UPN needs to have a routable domain name as the UPN suffix. So, the Inframan.local cannot be used and the Inframan.nl domain name needs to be used. It is strongly recommended to use the same name for the user’s primary SMTP address and the UPN. In this scenario the user’s Email address will be like J.Brown@inframan.nl and the corresponding UPN will be J.Brown@inframan.nl as well. 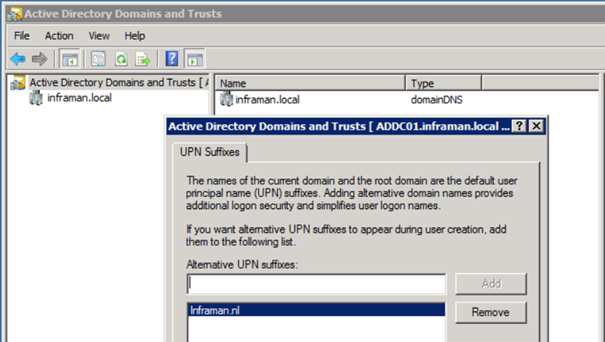 Once added you can use the Active Directory Users and Computers to quickly change the UPN suffix for users. Navigate to the correct Organizational Unit, select all users and select properties. On the Account tab check the UPN suffix check box and use the drop-down box to select the proper UPN suffix. Another issue in our environment was that all users have an @inframan.local SMTP address. This is caused by the default Email Address Policy that still holds a @inframan.local entry so all users that were created still received the @inframan.local email address. This will create an array with all Mailboxes in the OU=Accounts Organizational Unit, and remove every Email address to contains the @inframan.local suffix. When running the IdFix tool again only two more issues remain, two Distribution Groups still contain an @inframan.local email address, but this can be solved manually using the Exchange Management Console. 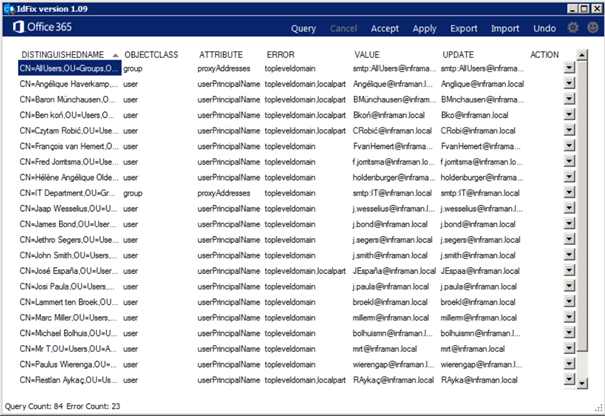 Once these two last issues are resolved our on-premises Active Directory is fine to connect with Azure Active Directory. Microsoft Azure AD Connect is the tool that’s used to connect and synchronize your on-premises Active Directory to Azure AD, the underlying directory for Office 365. Azure AD Connect uses service accounts both in the on-premises Active Directory and the Azure Active Directory. In the on-premises Active Directory the service accounts need to be a member of the Enterprise Admins security group, in Azure Active Directory the service accounts needs to be a Global Administrator account. Note. There’s no need to assign the service account an Office 365 license. 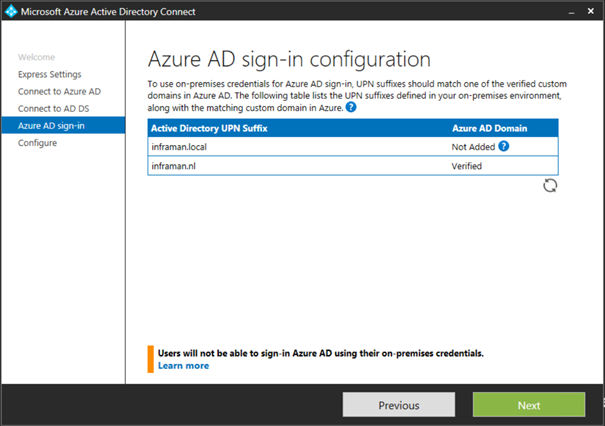 You can install Azure AD connect on a dedicated server (my preference and recommendation) but it can also be installed on a Domain Controller. The downside of this (I think) is that you end up with Domain Controllers with different configurations, something that I’d like to avoid. Install a new Windows 2012 R2 server, install .NET Framework 4.5 and install all available patches. After downloading the Azure AD Connect software from the Microsoft website (https://www.microsoft.com/en-us/download/details.aspx?id=47594) you can start the installation. 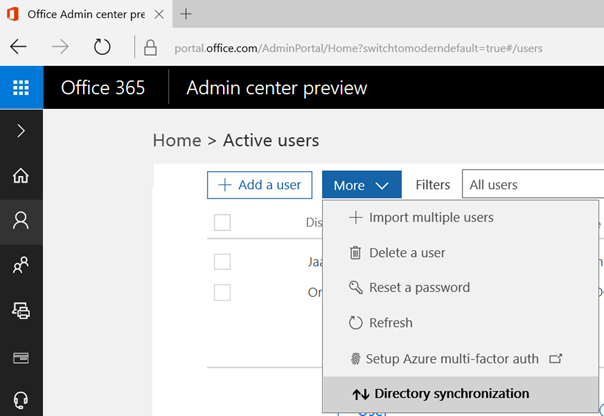 Before you can install and configure Azure AD Connect your Office 365 tenant needs to be enabled for Directory Synchronization. Logon to your tenant using tenant administrator credentials and click on the Admin tile. In the left-hand navigation menu click on the user icon and select Directory Synchronization in the More dropdown menu. The directory synchronization wizard is started, and you can just follow the wizard. During the Deployment Readiness Check you can start the Azure AD Connect setup application, and the wizard will guide you through the setup of Azure AD Connect. Figure 8. Use a service account to connect to Azure Active Directory. Tip: The password of the service account in Azure Active Directory will expire every 90 days without notifying you as the administrator. Use the Set-MsolUser -UserPrincipalName <service account>@<tenant>.onmicrosoft.com -PasswordNeverExpires $true command in Azure Active Directory PowerShell to set the password to never expire. Check the Manage users in Office 365 using PowerShell article for more details. Figure 9. The inframan.nl domain is verified, the inframan.local domain is not used (and cannot be added). Figure 10. Make sure you check the Exchange Hybrid Deployment checkbox. 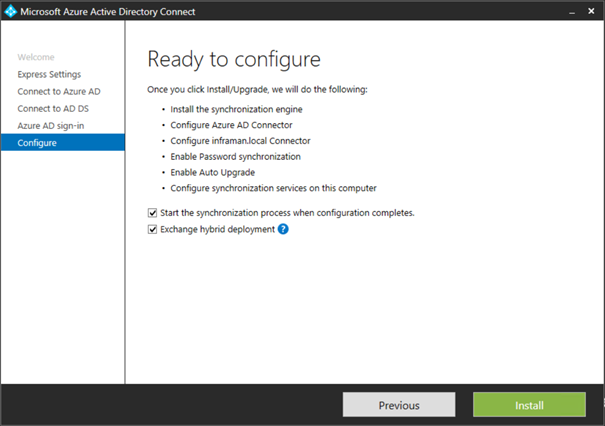 When Azure AD Connect is installed you can continue with the Directory Synchronization wizard. Click Finish when everything has been setup. Figure 11. Click Finish to close the Deployment Readiness Tool. Azure AD Connect will automatically start and perform a full synchronization. 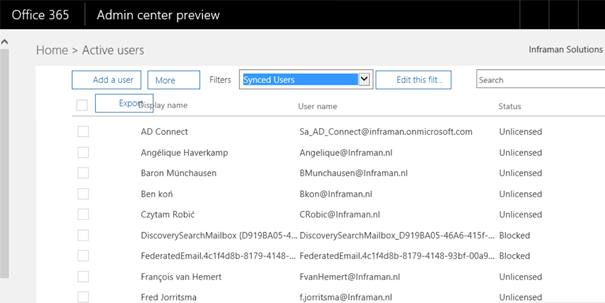 When you check the Office 365 Admin Center you’ll see the users from your on-premises Active Directory appear. Please note that they are unlicensed at this point. Figure 12. Users from on-premises Active Directory will appear in the Office 365 Admin Center. You can use the Office 365 Admin Center to assign a license to all synced users from on-premises Active Directory. Filter all unlicensed users, select all users that need a license and in the actions pane select Edit Product Licenses to assign the appropriate license. The next step is to implement the hybrid configuration with Exchange 2010 and Office 365. This will be discussed in my next blogpost. Hi Jaap, thanks for maintaining this blog, your articles are very clear and helped me out quite some times. What is your opinion of phasing out onprem Exchange altogether? After a cutover migration maintaining an onprem Exchange server feels a little redundant, although it’s quite handy managing Exchange Online. In my scenario ADConnect is in place, most of the management options are locked. I never recommend decommissioning the last Exchange server on-premises. This one is needed to manage your mailboxes in Exchange Online. While this can be done with ADSI Edit it’s pretty complex, prone to error and not supported. This is because of managing users/attributes,groups etc with ADSIEDIT can lead to duplicates and thus sync problems. Is there any other automated solution available for the same. I am getting very confused at this decommisioning process. Please help!! there are several vendors that sell provisioning solutions, some of them originate from selling hosting solutions, but these work in a hybrid environment as well. I agree, it still is frustrating and confusing. The only thing I know is that Microsoft is working on it, but it’s rather complex. I receive the error HCW8001 – Unable to determine the tenant Routing Domain. Are you ever see this error? 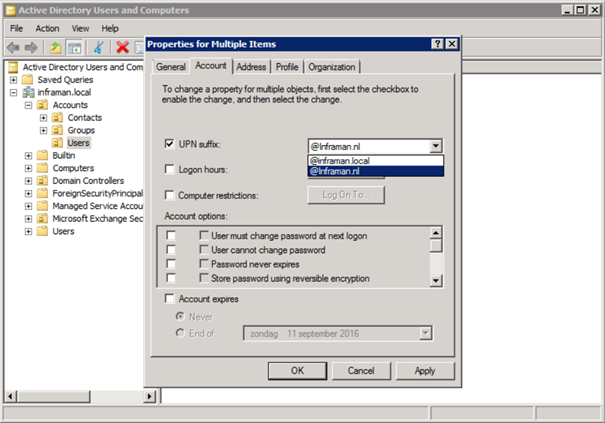 Hi, after moving all mailboxes you can upgrade your Exchange 2010 server to Exchange 2016. Install the new server and configure it accordingly, should not be a big deal since there are no mailboxes on it. Once configured you can download and run the HCW on Exchange 2016 and you’re good to go. Do you have any migration document for migratiing exchange 2010 dag to office 365.please advice me on this query. I am learning migration of exchange. 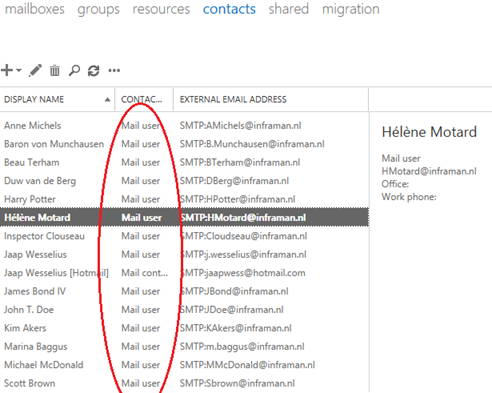 I have some trouble understanding WHY we need an onprem exchange if all the mailboxes are moved to o365? 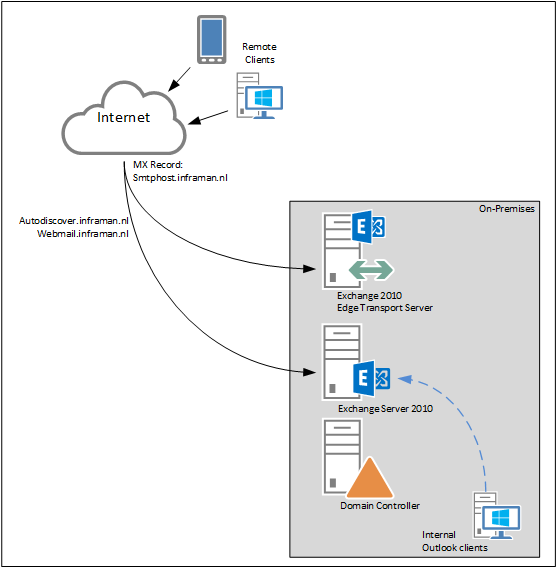 I have tested this setup and in “https://outlook.office365.com/ecp” I can manage the recipients mailboxes, but is this because the onprem exchange is stil connected? I found this https://techcommunity.microsoft.com/t5/Office-365/Remove-On-Premises-exchange-Hybrid-and-go-fully-Online/td-p/143255 and it explained quite well what I was thinking. If you have directory synchronization in place then you have to manage users and mailboxes on-premises. You cannot edit mailbox properties in Exchange Online in this scenario (well, for most properties this is). All changes are made in Active Directory and Exchange on-premises, and these changes are replicated to Exchange Online. In the article you mentioned here, the Azure AD Connect is removed, and the accounts in Office 365 are changed to ‘cloud identities’ which are fully managed in the cloud, and not in your on-premises Active Directory. In this scenario, there’s no connection between Active Directory and Office 365 anymore. Does this help?